So lets keep a long story short. 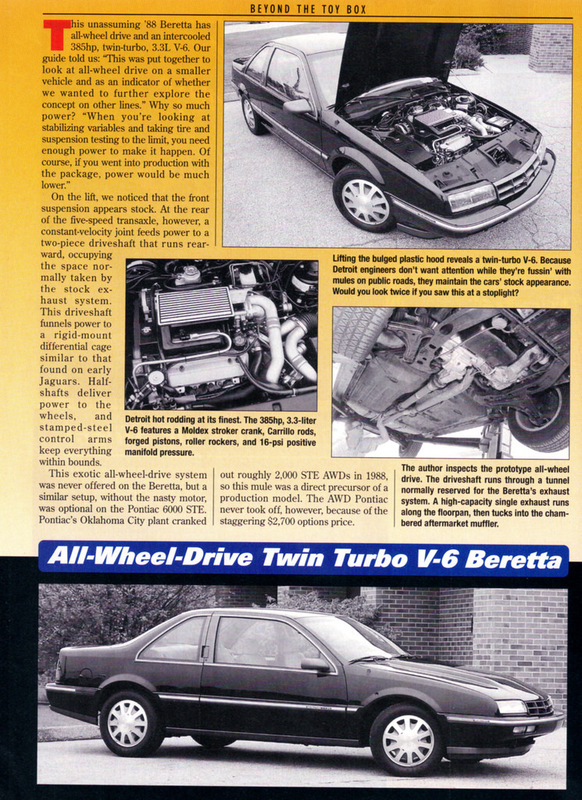 GM was forced to sell most of its heritage museum collection and the AWD Twin Turbo Beretta test car was one of them. Unfortunately, no one in the club at the time of the sale was in any position to buy it. It sold in 2008 for $8500. No one saw it again till it surfaced on eBay in 2010 for 10k, located in CT on top of it. SO, I went for a ride to go visit the individual. I got a chance to see the car, document some things, take a ton of photos and hear it run. That was that until 2018 rolled around and the Feretta was making headlines again. When I saw a member obtain the Feretta, and others start to ask about the AWD TT car, I decided since I knew were it once was, that I should research it. I was now able to purchase this car and luckily the original Barrett Jackson buyer still had it. Emails were sent and we agreed upon a price. I went and picked it up the next day. 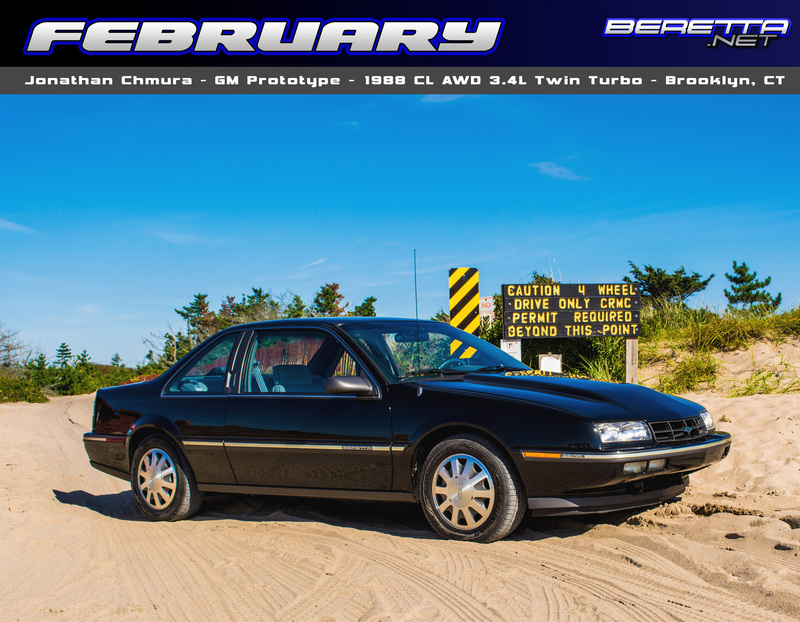 The nice thing about buying the car from a used car dealer/collector, he was able to re-write the bill of sale to have the actual vin number that was noted on the door and under the carpet, this allowed me to register the vehicle as a 1988 Beretta CL 2.8L v6 car. On to the back story about the car, as found in HotRod Magazine June 1998 Edition. Since buying this car I have found a few items that needed to be replaced or serviced since it’s been sitting so long… Lets start with the fuel system. Luckily the tank and everything else was in good condition and working order, the injectors on the other hand… those needed to be fully replaced. Being so old, one failed shut and another was stuck open. Car ran, but not well at all. I did get the car running and driving for Bfest 2018, but unfortunately the turbos were not up to snuff to perform the way they should. They are variable vane turbos and the rear one the vane system is stuck in the quick spool location. They are supposed to transition to allow more flow as the boost rises but the actuator was stuck. That’s a project for the future when I really dig into it. Items replaced so far, fuel injectors, water pump, motor mounts, brake pads, rotors, rebuilt calipers and master cylinder. I’m sure as time goes on, I’ll find more that needs to be replaced and fixed, and hopefully when I do, I’m able to find parts for it. Final plans for the car, Full driveline teardown and restoration to how it was when they were last testing it. I don’t plan on upgrading anything other than getting many items cleaned up and powder coated. This car will stay as original as it was when GM had it in their heritage collection.